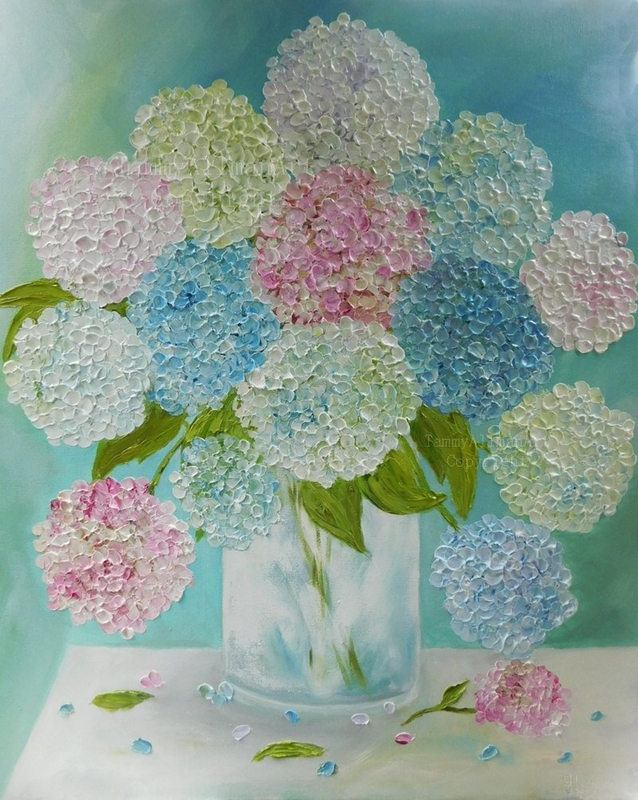 Multi colored hydrangea in a vase or you can choose your own colors! If you would like a custom painting of this piece please allow two weeks for completion and for the oils to dry. You are welcome to send photos of your fabrics so that I can match colors to your painting. Please contact me if you need a size that is not listed above and if you want to make changes. I will send photos for your approval before shipping. Thank you so much! Measure for the size you need. Select the size you need. If not listed contact me and I will put up a custom size for you. Place in special request the changes you would like to make or say none. Choose your colors of the Hydrangeas you would like. Canvas: Choose your canvas Gallery for hanging straight to the wall or Studio canvas if your wanting to frame your painting. It's that easy and I will get started on creating a custom piece just for you. SIgned by me and includes my artist statement on back. INTERNATIONAL SHIPPING: 30"x 40" paintings and above are oversized for international shipping so please contact me for international shipping rates. Please contact me with the size painting your wanting and the address to your area. I will give you shipping cost according to the size painting your wanting and set up a private listing for you to purchase. All rights reserved to artist TammyAllmanArt. International copyrights also reserved to TammyAllmanArt. You will need a license to copy or use this image in any form. International attorney retained by artist should work be stolen or used in any form. Artist retains all rights after sale and this painting cannot be copied or sold without a license from artist. Ships by best carrier to your area. Tracking information will be given when shipped.